I've always had quite a good track-record when it comes to keeping houseplants alive. Sure, there was the odd African Violet death when I was first getting started, but more recently I've been a lot more attentive. However, recently the exception to this rule seems to be the Alocasia or 'Elephant Ear' plant that had, until recently, been a permanent resident on my kitchen table. I became a bit obsessed with these plants after spotting them in my local garden center last year, but we were in the process of moving house, and it really wasn't the time to be adding more houseplants to my already overflowing collecting! 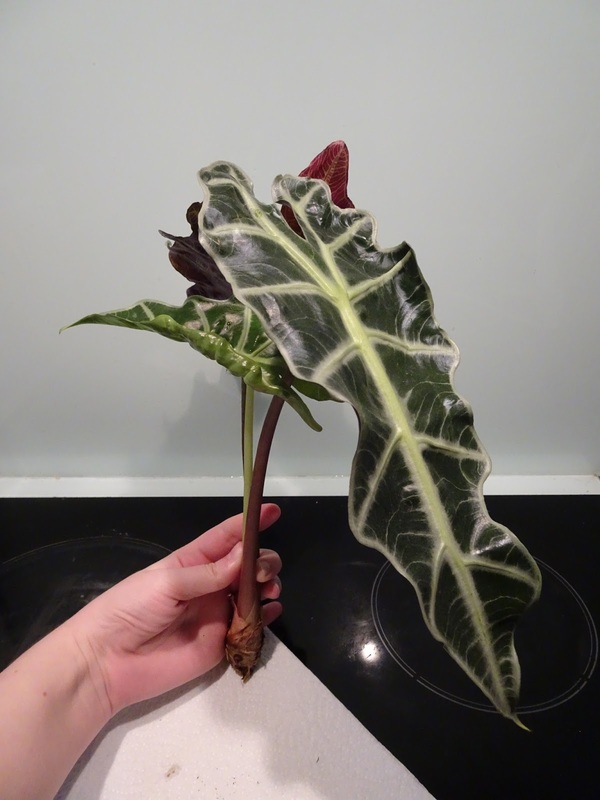 An Alocasia was added to my mental 'Wish List', and when I stumbled across one for £5 in Tesco (including ceramic pot), I thought it was the perfect, affordable option. Fast-forward to last Tuesday when I decided to move some of my houseplants around because I'd picked up a great new plant pot for my Mother in Law's Tongue and wanted to display it. As I picked up my Alocasia, the whole plant fell over. I couldn't believe it, it just fell straight out of the pot! Following a few choice words, I tried to assess what the damage was. On closer inspection, I was absolutely stunned to see that all of my Alocasia's roots had totally disappeared! There were none. Nada. Zero. 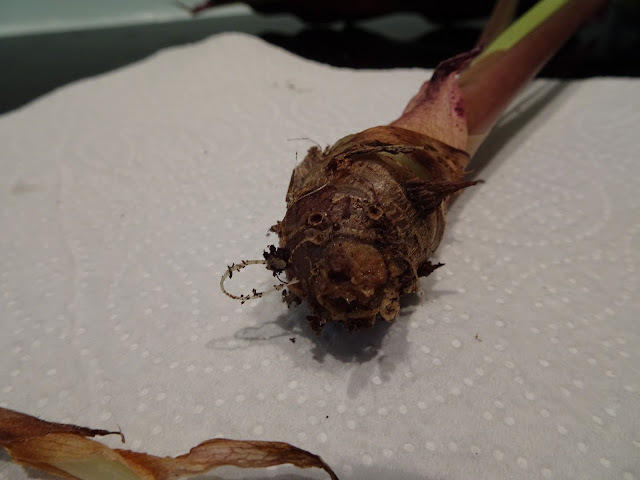 When I touched the tuber it was soft, almost squishy, and after a quick google, I discovered that this meant that my poor Alocasia had root rot. 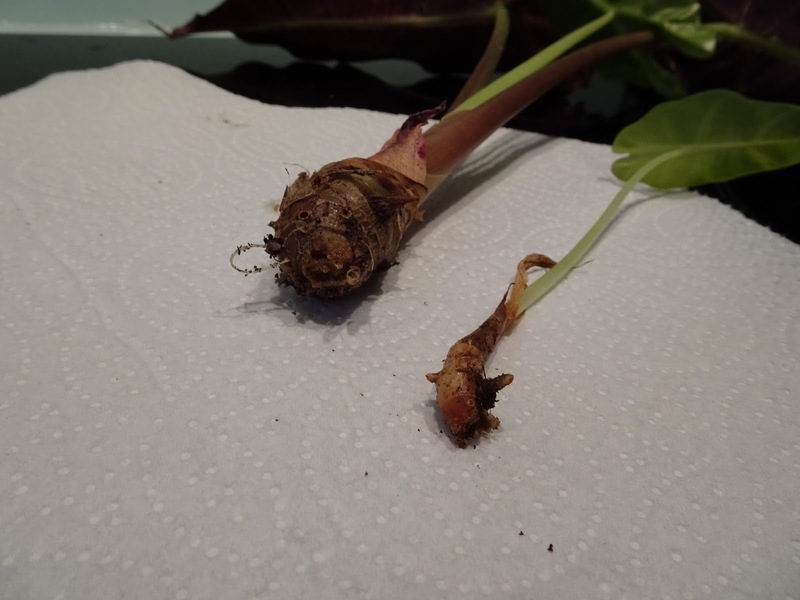 Unfortunately, after closer inspection, I concluded that because of the extent of the root-rot, there was no way that I was going to be able to save the plant. 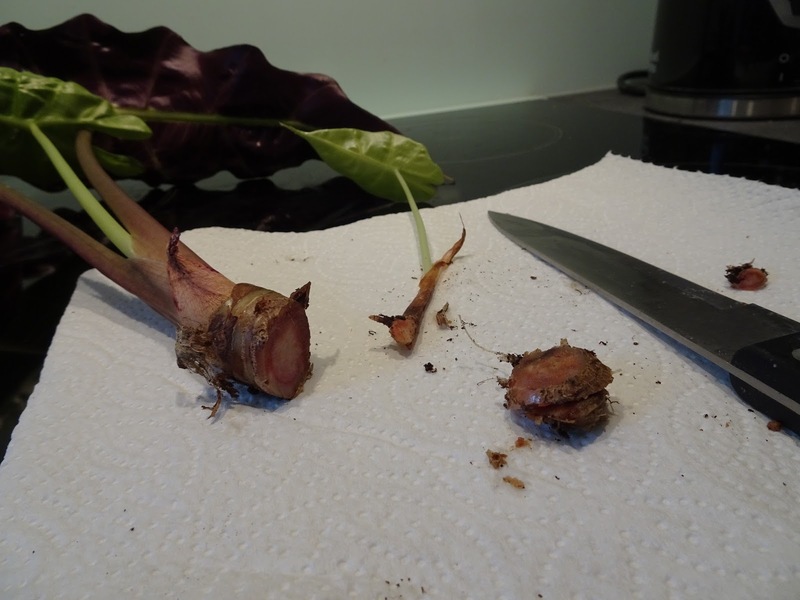 As you can see from the photograph below, I did attempt to play surgeon and try and remove as much rot as possible in the hope that it hadn't extended too far into the tuber, but alas it was to no avail. Alocasia plants are poisonous to humans and animals, so if you ever find yourself having to do a similar thing, please bear this in mind and make sure that you thoroughly disinfect everything that you use. Following the untimely death of my Alocasia, I decided to do some research into what makes them happy, and where I might have gone wrong. I thought I'd share this with you in case you ever stumble across a similar problem. 1. Alocasia's are tropical plants and therefore love humidity. This can be a problem particularly in the winter when the central heating is on and the air in your home becomes dry. 2. The compost needs to be kept moist, but not soggy. I think my problem was that I let the roots dry out too much in between watering, and then over-compensated with too much water. 3. Getting the balance between too much light and too much shade can apparently be difficult. Alocasia's don't like really bright, direct sunlight, but at the same time don't appreciate being kept in the shade. Fussy eh? So all in all, they're definitely not the easiest plants to keep alive, and I certainly underestimated how much care and attention they need. Maybe one day I'll invest in another one and see how I get on (I did notice that they were selling them in IKEA Southampton for £7 the other day), but in the meantime, I do have enough plants to sink a small battleship, and I'm really running quite short of space! Have you ever owned and successfully kept an Alocasia alive? I hope it's not just me that's had difficulty with these beautiful but temperamental plants! Drop me a comment below.